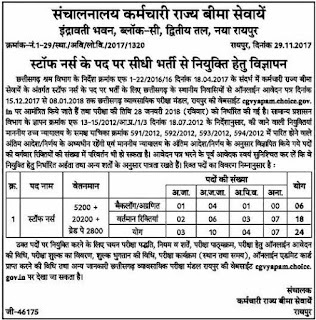 Staff Nurse jobs in this CG Vyapam Recruitment 2017.Candidates who are interested in this Staff Nurse vacancy they can apply online from 15-12-2017 to 08-01-2018. Candidates will shortlisted or selected based on their marks in B.Sc Nursing or GNM course, 10+2, 10th marks and Written test will be conducted for this CG Vyapam ESIS Staff Nurse Govt Jobs. Online applications will be accepted through CG Vyapam official website of cgvyapam.choice.gov.in. 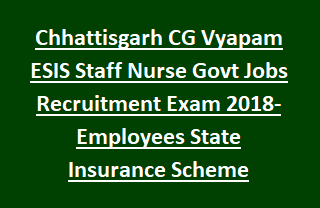 Written exam pattern, exam fee, online application procedure, exam syllabus and other details about this CG Vyapam ESIS Staff Nurse Govt Jobs Recruitment is given below. 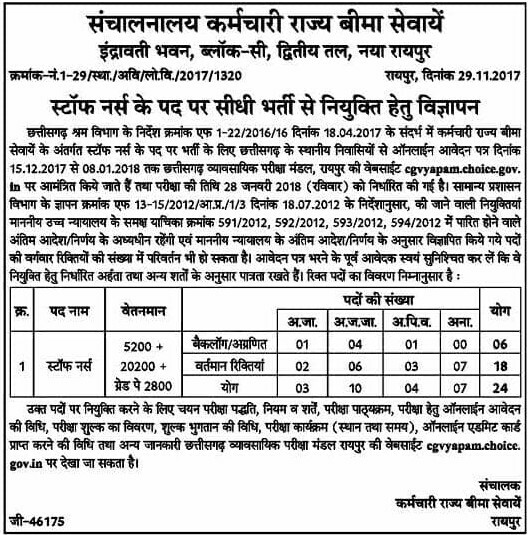 There are total 24 Staff Nurse Vacancies in this Employee State Insurance Scheme Recruitment 2017. As on 01-01-2017 candidates age limits are 21-30 years and for reserved candidates upper age limit is 35 years. Candidate should have qualified B.Sc Nursing or GNM course from any recognized university. Must have registered with Nursing council of Chhattisgarh. Selection for ESIS Staff Nurse vacancies will be held through merit in written test only. Written test will be conducted in objective type only. Syllabus will be Degree level and for General studies 12th Standard level. Interested candidates can apply online for this CG Vyapam Recruitment on or before 08-01-2018. At the time of online application candidates must have submit all the details. It is mandatory to provide valid Email Id and Mobile number for this CG Vyapam Staff Nurse recruitment 2018.